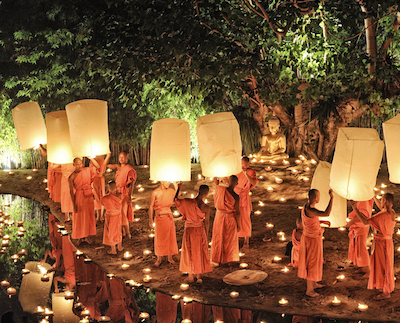 Chiang Mai radiates the essence of Thailand. Located in the northern province, the atmosphere is laidback and relaxing. It’s a lovely place to stop and spend a month living, as we are currently doing. Within the city, there is an abundance of gorgeous temples and lively markets. In the Chiang Mai region, food reigns supreme. Most Thais consider the food of this area to be the best in the country. There are countless activities to fill your days, including visits with elephants, hiking excursions, rafting, Muay Thai boxing matches, cabaret shows and cooking classes, just to name a few. I’ve actually been keeping a pretty serious running tab of all our expenses during our month here! It’s amazing how inexpensive we are able to live. For your reference, we are a couple, we are living in an Airbnb 15km outside of town. It’s a small bungalow (just gorgeous, and equipped with A/C!) on a property with 2 swimming pools, lush gardens, and 12 other bungalows. We pay $15/night for our accommodation. We are renting a scooter for $2/day, this is our main transport for getting into Chiang Mai city center, which we do 2-3 times a week. Delicious Thai food from the street vendors down the road costs $1 per meal. Tickets to a Muay Thai boxing match or a ladyboy cabaret show cost about $8 – $9 per ticket. Dinner at an organic western restaurant will set you back about $6 – $8 per person. A can of beer from 7-Eleven is $1, a large bottle of Chang beer at a bar is $2 – $4. A 60-minute Thai massage is $4 – $5. Overall, our average daily expenditure has been $50/day for 2 people (this is including accommodation), so $25/day on average per person. Our cheapest day was $25 total for both of us (incl. accommodation, we hung out at the pool all day & ate locally), our most expensive was $90 (we went shopping at the market, drank a lot, ate everything we wanted, went to a cabaret show). Cockfighting! It’s crazy to experience, and will make you feel all kinds of weird, but the local Thai men love it. We first arrived to our accommodation on a Thursday, which apparently is cockfighting night at the venue just next door. I’m a photographer, so I have developed this ability to remain objective, restraining all emotional bias, and just get in there and take the shot. But the energy at the cockfighting tournament was intoxicating. Imagine 400-500 guys (no women at all, except for the few serving drinks, apparently it’s a sport only guys can get into) yelling, drinking, laughing, and matching their prized roosters against others. These men take pride in their roosters, cleaning them between matches, bandaging their wounds, almost like a Nascar pit crew performing maintenance. Now this isn’t the illegal cockfighting you might find in Mexico or Indonesia, where I’ve been told people will strap razor blades to talons and roosters will fight to the death. This is a legal operation, where birds fight for a designated amount of time and both walk away at the end. Some birds live for years and years. That said, it can be difficult to stomach, fights usually result in bloody wounds. The cockfighting match was complete cultural immersion. In a bizarre way, it represented something we all crave when travelling… being completely immersed in a local cultural event that is so unlike anything we could ever experience back at home. No other foreigners were there, and no one spoke English. It was also challenging because it really forced me hold back any prejudices or prior formed opinions and just observe what’s happening, appreciating the experience for its intensity and the cultural insight on display. I wake up around 8am, I like the mornings here because they are cooler. We are in the hottest time of year right now for much of Southeast Asia, before the monsoons begin in earnest at the beginning of June. Breakfast consists of coffee and fruits. I’ll spend some time running through emails and Instagram (I’m kind of addicted to Instagram right now haha!). I am living outside of the city center, so I may ride to town on my scooter for sightseeing, there are so many beautiful temples in the old town. There are also incredible Thai massage places there too. If I remain at home, I may spend the afternoon relaxing at the pool, or just inside my bungalow in the A/C working on photography projects. Lunch and dinner usually come from the local village street vendors. They specialize in a dish called Khao Soi, which is an egg noodle dish with curry & coconut sauce. The evenings are cooler again, so I may go to a night market for shopping, or some other kind of entertainment like Muay Thai or cabaret shows. The Thai owner of our bungalow has a great sense of humor and speaks enough fragmented English to communicate most things. He has a funny way about him that I think is a bit different from other Thais… he’s very much a man in control and can be a bit abrasive for Thai standards. But I like this, and have enjoyed observing his demeanor. He takes great pride in his customers and would do anything for us, from organizing the best seats at the boxing match, to communicating in Thai over the phone to a taxi driver how to drive us back home at 2am, to bandaging up wounds from a dog bite. One of the funniest things about him is that he owns a pet iguana. The iguana lives in a cage by the swimming pool. Each night, he is taken out of his cage, and the owner plays with him, feeds him vegetables with a spoon (apparently he used to feed by hand but the iguana would bite), and even drops the iguana in the pool to swim around. It’s really hilarious and kind of weird to watch. The heat has been a challenge. Like I said, April-May in Southeast Asia is HOT. The forecast right now says 106F (41C) each day for the next week. I’ve had to just adjust my schedule, avoiding the mid-day heat when possible. Something else I’d like to point out… we are staying outside of the Chiang Mai city center, which we like. Although we enjoy our occasional visits to the old town, we have found it to be very dense with tourists. I’m not sure if it’s a popular time of year, or if Chiang Mai is just on everyone’s travel itinerary, but we’ve found it to be slightly off-putting. If you are planning on spending extended time in the area, I would recommend finding accommodations in one of the many small villages outside of town (perhaps with a swimming pool and some gardens.) The city center will be an easy scooter ride away. You’ll just have a more local experience this way. Other than that, daily life in Chiang Mai can be very laid-back and thoroughly enjoyable. And it can also be very cheap, so I’d absolutely recommend it for a longer-term stay, especially for digital nomads or those seeking a potential retirement destination. A little language goes a long way. Learn how to say hello and thank you in Thai. Learn how to order your iced coffee with no milk and sugar, or however you prefer. Learn how to say “This is delicious!”… that last one has gotten me so much mileage. Thai people are very friendly and love to laugh. And they especially love foreigners. Show them you have taken the time to learn about their culture and language, it will be very much appreciated and reciprocated. Also, a practical tip… if you plan on staying here for more than 30 days, check on your visa options before leaving home. It will be easier and you might save a bit of money. Next, we are heading to the islands and beaches in the south of Thailand. After that, we aren’t sure. In effort to avoid some of the heat, we may head to the mountainous areas of China.